Published September 25, 2015 By Leisa Good This post may contain affiliate links. Regardless, I only recommend sites I've researched and/or used and trust. Do you have an eye for fashion? Do you think that Hollywood stylists have all the fun? Would you like to get in on the action and make money too? Well, keep reading because Stitch Fix might have something in store for you. As of August 31, 2016, Stitch Fix is hiring stylists who live in or near Austin, Cleveland, Dallas, Minneapolis, Los Angeles, Pittsburgh, Sacramento, San Diego, and the San Francisco Bay areas. What Exactly is Stitch Fix? Stitch Fix is a monthly clothing subscription box company that is extremely popular with women. Every month, customers who have signed up for Stitch Fix receive curated, hand-picked boxes of new clothing from name brands, all of which are based on the customers' taste, style, size, budget, and lifestyle. It's a great, fun service and the company is growing by the day! After the customer signs up with a profile, one of the professional stylists will go to work and ship out five clothing items to the address provided by the customer. The customers get to try on the items in the comfort of their own homes and send back what they don't like. The customer will only pay for the items they decide to keep. Customers sign up after creating their profiles to the subscription level of their choice. Subscriptions can be for every month, every other month or even every three months. If the customer buys all five items, then a 25% discount will be given. However, a $20 stylist fee will be applied as credit towards any future orders. The average clothing item is about $55 before any discounts are applied. It's like having your own celebrity stylist! L.A. Made, Sanctuary, Mystree, and Tart are just some of the brands offered. Currently stylists are only available for women—even pregnant women—however, in the future men might be able to get in on the action. You fit in — no pun intended — by going to the Stitch Fix career page and finding one of the many locations nearest you to provide stylist services. Many of these positions are remote/work at home; you just have to be patient enough to search for them. Sometimes the popular job search site, Indeed, also posts these positions. For the stylist position, you will need to be at least 18 years old and committed to working 15 to 30 hours a week. You will also need to go to onsite training in the designated area. Training lasts about 6 hours. What Computer or Equipment Skills Will You Need to Get Started? You must have access to a laptop with Internet connection. You must have good computer skills with web-based applications. You must have a working knowledge of social media. How Much Money Can You Make as a Stylist for Stitch Fix? Stitch Fix does not publicly list the rate of pay for stylists on their job listings. However, Glassdoor has some salary information posted for the stylist position that indicates it may be around $15 hourly. What Do Others Say About Working As a Stylist For Stitch Fix? Glassdoor has some great stylist reviews here. 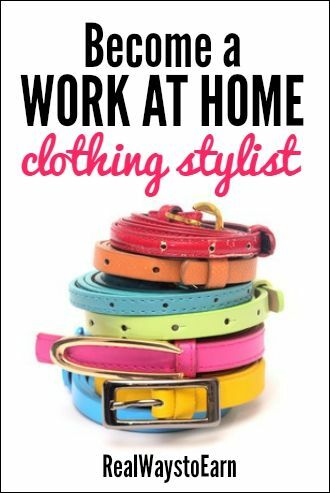 Overall, most work at home stylists for Stitch Fix seem to love the job, although a few complain about Stitch Fix expecting them to make customers happy with very limited inventory at times, and that can be difficult to do. How Can Interested Individuals Apply to Become Stylists at Stitch Fix? Just visit their careers page and check for work at home stylist openings in your area. Do you want to try Stitch Fix as a customer first? If so, you can go here. Good luck! I was so excited to apply. I went to the site and made a list of everything I needed to get together for my application (it’s midterm week for me at school so it took about 2 days). I went back and the whole page was gone. They’re no longer looking. There wasn’t anything listed on the page that stated applications were only being accepted during a certain time frame. This was incredibly disappointing. I’ve honestly never applied for a job that didn’t have set parameters such as list detailed upfront. Very interesting. Wish they hired in Atlanta, GA. Yes, the job is open in a lot more places than it used to, plus it makes sense when you consider the initial level of training involved. That is why I suggested seeing if the job was listed in your state or not or hired there. There appears to be a “crossover” for some of the smaller closer knit states. This sounds interesting but my state is not listed and probably never will be. I wouldn’t mind going to another state for the training if it’s just one day. “Thank you for reaching out to us and for your interest in Stitch Fix! Currently all of our positions are for specific locations in which our employees must be located. Even though the position is a work from home option, we still require weekly check ins with your lead as well as other trainings and meetings that go on in that area. We believe in a wonderful company culture, and want each of our employees to benefit from this! Let me know if you have any other questions. Keep an eye out on our website for other job postings – we may be coming to your area soon! Thanks for sharing that. For what it’s worth, the job is open in a lot more places than it used to be when I first started seeing it. So that makes me hopeful they will continue to expand and more people will have the opportunity to do this.